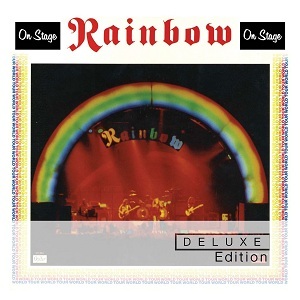 Rainbow are one of the legendary names of Rock and featured some amazing members including Ritchie Blackmore, Ronnie James Dio, Cozy Powell, Roger Glover, Don Airey, Graham Bonnet, Joe Lynn Turner and more. "On stage" was the bands third album and was recorded live over several dates and then spliced together to form the album. When I say it was spliced together, I don't mean they took different tracks from different shows - they even took parts of a song from several shows and spliced them together seamlessly to get the best bits from each show. The album was released as a double album with the running order being very different to the live shows as they needed to change it to fit the limited vinyl capacity as best they could. Thankfully with CD's that's no longer a worry and instead of four sides of vinyl it all fits on a single CD, but they have still kept the original album's running order. The bonus disc on this Deluxe edition contains six live tracks, all taken from the band's Osaka concert in 1976. Most of the songs are just different versions of songs on the standard album, but the other is a song not included in the original album - "Do you close your eyes". At a first glance, six songs seems quite little for a bonus CD, until you look at how long the songs are - the shortest is just under six minutes, but most are over ten minutes with the longest being over 18 minutes long, so altogether thats well over an hour of bonus material. It's always been a great live album, but the addition of the bonus disc makes it even better - an essential addition to the collection of any fans of Rainbow or Ronnie James Dio. On stage (Deluxe edition) is out now.